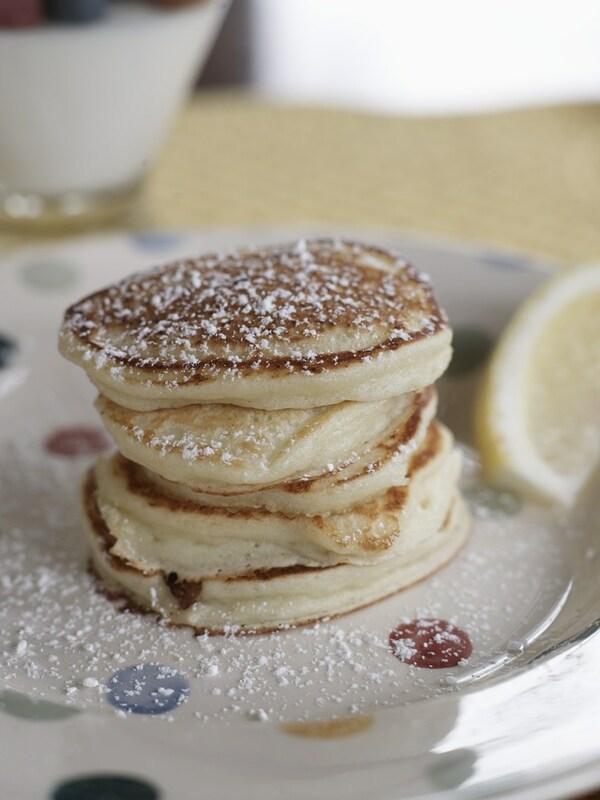 Lightly kissed with lemon zest and lemon extract, these pancakes are seductively delicate and airy and a welcome change from the expected. A nice change from the usual pancake fare. In another bowl, whisk together the ricotta, milk, lemon zest, lemon extract, and egg yolks. Add the dry ingredients and mix well. In a clean, dry bowl with an electric mixer, beat the egg whites until soft peaks form. Gently fold the beaten egg whites into the ricotta mixture and let the batter rest for 3 minutes. Lightly spray a griddle or large skillet with vegetable spray and heat it over medium heat. Drop large tablespoons of batter onto the griddle and cook for 2 to 3 minutes on each side. The pancakes will measure about 3 inches across. To prevent burning, don’t let the griddle get too hot. The pancakes will look slightly dull and a few bubbles will form on the surface when they are ready to flip. Serve dusted with confectioners’ sugar or keep the pancakes warm in the oven. love this for a relaxed brunch on the weekend, lemon is fab! The stated number of pancakes the recipe will make looks like it’s way off. The pancakes are not regular size, but rather small. So you will get 30. Make them to find out for yourself before judging. The new family favorite! At our house we like pancakes for Saturday night dinner and these have been requested the last two weeks.